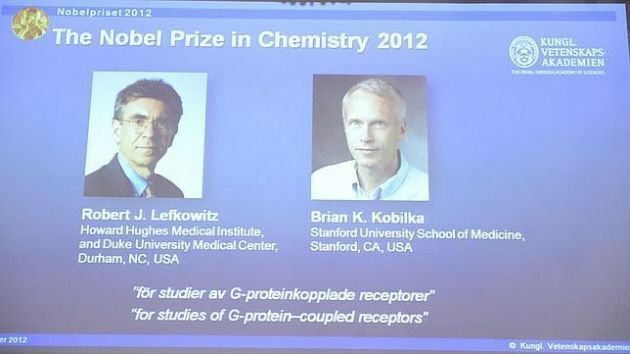 The 2012 Nobel Prize in Chemistry has gone to US researchers Robert Lefkowitz and Brian Kobilka, whose work shed light on how the billions of cells in our body sense their environments. Robert Lefkowitz and Brian Kobilka will share the prize of 8 million Swedish kronor ($1.2 million). Their work focuses on what are called G protein-coupled receptors, a number of proteins that reach through cell walls. Understanding how they work has been crucial to unravelling the complex network of signalling between cells. Sven Lidin of the Nobel committee started his summary of the work by shouting “Boo!” to assembled reporters; the rush of adrenaline one gets when scared, he explained, is just one manifestation of this vast network, communicating a chemical signal across billions of cells, through otherwise impenetrable cell membranes. Dr. Robert Lefkowitz, of the Howard Hughes Medical Institute in Maryland, was reached by phone during the conference. He explained that the receptors “serve as the gateway to the cells for many different neurotransmitters and hormones in our body”. They capture signalling molecules both in healthy bodies and are the target for more than half of all pharmaceutical drugs, as Dr. Robert Lefkowitz said. Dr. Robert Lefkowitz started investigating the receptors by following the movement of radioactive isotopes attached to hormones within cells in the laboratory, trying to track down how signals get through cell membranes. Dr. Brian Kobilka – who is now at Stanford University in California – joined the team in the 1980s, and they took another tack to discover how the receptors come about, searching within the human genome for the code that lays out the genetic instructions for them. Taken together, the pair’s work, as the Nobel site’s summary explains, represents “knowledge… of the greatest benefit to mankind”. The first-ever Nobel prize in chemistry was awarded to Dutchman Jacobus van ‘t Hoff for his research into reaction rates and osmotic pressure. The total number of chemistry Nobel recipients has now reached 163. On Monday, the 2012 prize for medicine or physiology was awarded to John Gurdon from the UK and Shinya Yamanaka from Japan for changing adult cells into stem cells, and on Tuesday the prize for physics was awarded to Serge Haroche of France and David Wineland of the US for their work in querying single light and matter particles. The prizes for literature and peace will be awarded later in the week, with the economics prize to be announced on Monday.